Appearance: (8) Ooze is the name of the game here, as we immediately spot the double-team of cheese AND cheese sauce. Red-white-green toppings were very appropriate, considering the neighborhood. Quality of Ingredients: (7) Even without our most cheese-sauce-friendly correspondent in tow, we had good things to say about the cheese sauce. It was right on the border of homemade-or-not, enough so that we still aren’t sure if it was from a can or the kitchen. The chips were also debatably made in-house. Guacamole was fresh, heavy on the red onion, and the salsa was more of a pico of fresh veggies. We enjoyed the Italian sausage, though larger pieces might have made a bigger impact on the palate. Distribution of Toppings: (8) Vito’s employed a distribution tactic we had never seen before– a layer of black beans on the bottom of the plate, but nowhere else. We found this a little odd until we considered that the beans elevated the chips enough to keep them from getting totally sodden in cheese sauce. Was this intentional? Unknown, but it did work. As could be expected, the combination of cheese and queso sauce left practically no chip untouched. Price: (8) At $11, these provided an ample amount of heart-stopping goodness for two people. Overall: 31/40. These were more Italian-inspired than a direct translation, earning them a place in the Best of Boston rather than the Specialty Nacho category. But who cares? They were pretty darn tasty. 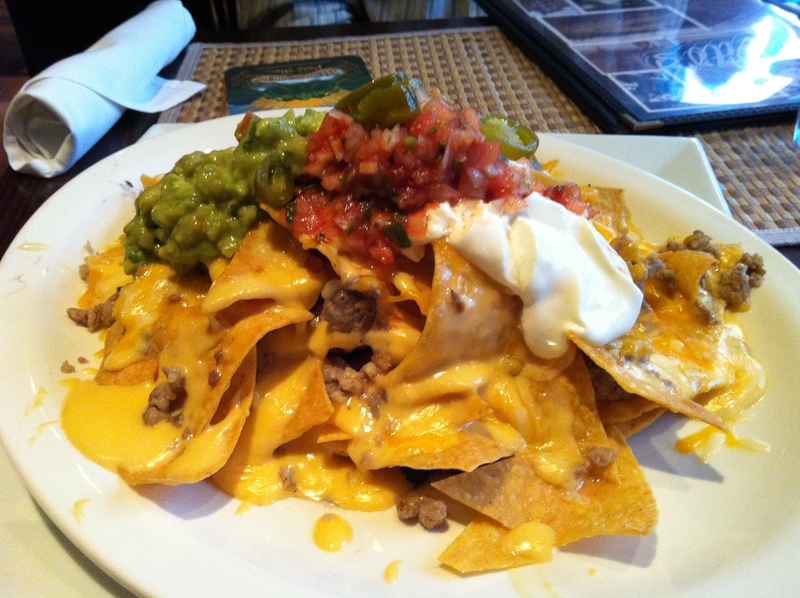 We are curious to come back and try the vegetarian nachos, with roasted and sauteed veggies. Tags: cheese sauce, North End, Queso, sausage, Sports Bars, Viva l'Italia! ← Toby Keith’s I <3 This Bar and Grill: America. FUTK yeah.